BOGOTÁ, Colombia -- Colombia's see-saw struggle over whether to allow a third, four-year term for President Álvaro Uribe shows little sign of being settled soon. 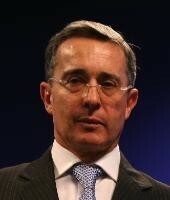 Uribe was initially elected in 2002 and reelected in 2006 after a constitutional one-term limit was overturned. In 2008, four million Colombians signed a petition in favor of a second constitutional reform that would allow Uribe to stand once again in the 2010 polls. Now, despite a farcical error in the petition's wording, it may well receive congressional support.